The Collinsville City Commission met Monday, Jan. 15th (at the City Hall Community Room, 106 N 12th Street) for a 7pm regular meeting of the City Commission and Municipal Authority. A. 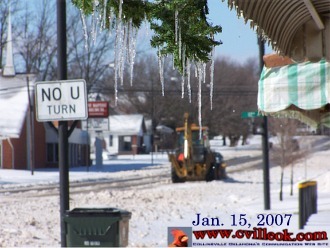 Approval of minutes of the Collinsville Municipal Authority Special Meeting of January 03, 2007. C. Approval of supplemental appropriation to CMA fund of $42670.15: reimbursement from JP Morgan for electric materials. All 77 Oklahoma counties declared a disaster area (by Governor & President) due to current sleet/ice storm. This may allow some FEMA funds here for recovery. A city crew is working on the local roads. The Collinsville electrical department is working in Pryor to help with their electrical outages. There were no reported ourages in Collinsville. A. Approval of minutes of the January 03, 2007 special meeting. C. Cemetery Deeds: Lloyd and Roberta Sonnier (1 space), Paul Haltom (1 space), Mary Ann Thornton (4 spaces), Robbie Hedges (8 spaces), Jessie and/or Jennie Hignite (1 space), Ronald E. Bacon (1 space). 7. Discussion and possible action on the purchase of an ambulance. Opening of bids was conducted on 01/09/07 and results are noted on following attachment. -- the attachment was not provided to the public present at the meeting ... but the lengthy discussion centered on an $88K bid (less $5K trade-in) for a 2nd new ambulance slightly larger than the other recent purchase. The commission authorized the city manager to make the purchase. 8. Discussion and possible action on proposed ordinance. Crossing the center line to park in diagonal space. -- the commission approved an ordinance making a turn crossing the center line of any Collinsville street (with or without a painted center line) to park in an opposite side diagional parking spot illegal. This will enhance the current no U turn ban. 9. Discussion and possible action on the case no. CJ-2006-7777. St John Villas vs. City of Collinsville. -- the commission took no action but will seek clarification on the exact legal description in the suit. This is to verify the assumption that the outdated city plat (which had provisions for streets in the area where houses are soon to be built) being vacated is restricted to the appropriate locations. The case is scheduled for a Feb. 1st court appearance which the city will not contest if the vacated plat is correctly described. 1. Consideration and possible action on bids no. 06-0010. A sealed bid for ~$206K was opened before the commission. Another unsealed bid for $182,324 had appeared on the city manager desk but could not legally be accepted. The commission agreed it would be best to re-request bids and hope the lower bid would be submitted correctly this time. A search for a potential used pumper was also requested. The intent of the "No U Turn" sign was beefed up Monday by the city commission to clarify that turns crossing the center of any roadway to park in diagional parking on the opposite side are also prohibited in Collinsville.